Radial keratotomy was introduced in North America in the 1970’s. At the time, it was believed to be a safe and effective alternative to glasses or contacts. Now we know that there are many side effects that plague the post RK patient such as glare, halos, fluctuating vision, blur, regression, susceptibility to infection, hyperopic shift, hydrops, corneal ectasia higher order aberrations (HOA) and corneal perforation. With these potential side effects, the post RK patient has become one of the greatest challenges we face as contact lens practitioners. It is easy to see why glare and halos are common complaints. 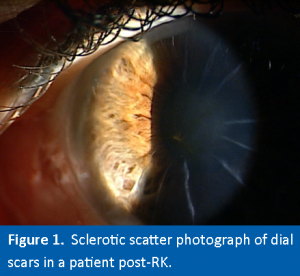 Some of the challenges of the post RK patient include fluxuating vision and discomfort. When fitting these patients with contact lenses, the option of soft contacts has proven to be unsatisfactory due to poor optics, fluxuating vision and uncorrected irregular astigmatism. Corneal GP’s can be difficult to fit on the oblate corneas created by the RK procedure and scleral lenses are known to have minimal tear exchange often requiring patients to remove, rinse and re-insert their lenses mid-day. These patients can demonstrate increased corneal sensitivity, compounding the fitting process. 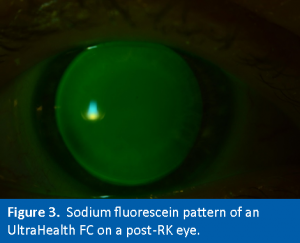 Hybrid contact lens technology advances in both materials and designs have provided post RK patients with the hope of improved comfort and a better visual outcome. The second generation SynergEyes® hybrid lenses are composed of a very high Dk of 130 gas permeable material in the center, and a high Dk of 84 silicone hydrogel material for the skirt. 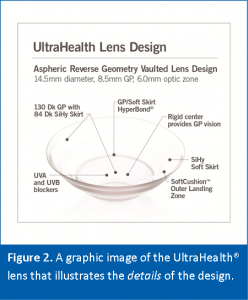 The UltraHealth Flat Curve (FC) lens has a reverse geometry vaulted design specifically developed to meet the numerous challenges of fitting these patients that have an oblate corneal irregularity. These are patients that are post RK, or have a history of other post-surgical issues, have mid peripheral steepening and other, flatter irregularities. Of note is the even pattern beneath the lens indicating no bearing on any part of the cornea. The lens is well-centered and well tolerated. UltraHealth FC utilizes the same variable lift design of the upper vaults of UltraHealth, but with a much flatter base curve. The initial 55 vault lens starts at 35.50 or 9.5mm. The lift curves rise to vault over the cornea in the periphery of the GP increasing sagittal depth, and then flattens out over the central portion of the cornea. 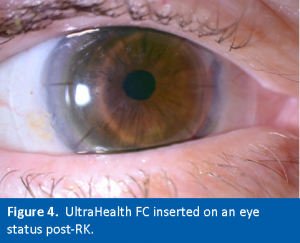 The UltraHealth FC is described by the practitioners who fit many post RK patients as their “go to” lens due to the great vision, stability and comfort, as well as the intuitive fitting process. Peg Achenbach, OD, FAAO is a graduate of Pacific University College of Optometry and is currently the Vice President of Professional Services for SynergEyes. She and has also worked in the contact lens industry with Bausch & Lomb, J&J Vision Care, and Contamac, Ltd. Dr. Achenbach’s professional career includes 16 years of private practice. For eight years she was involved in research and drug development in oncology, HIV, dermatology and nutritional supplements as a co-founder of a biotech company. She has been an international lecturer for the past 20 years and was a panel member of the New Jersey Commission for the Blind and Visually Impaired.